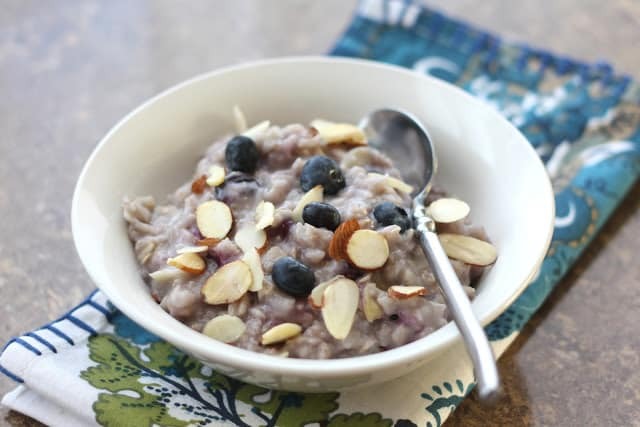 Oatmeal loaded with blueberries that plump up when cooked and burst with flavor in each bite is currently my youngest son’s favorite breakfast. 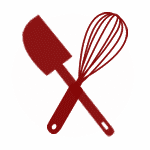 With over 20 different oatmeal recipes in my recipe index, I was surprised to notice that this version was not already posted. 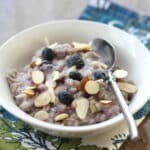 I’ve been making this blueberry oatmeal for a couple of years now and it is one of my personal favorites. I make this oatmeal every single time I have blueberries in the house. I don’t always have heavy cream in the house when I make this. However, each time I do use cream instead of milk, I am reminded just how amazing it is. It’s almost unbelievable what a tablespoon or so of cream does to make this the creamiest richest oatmeal you might ever want to eat. Are you looking for more breakfast ideas? Check out all of our Top Oatmeal Recipes! 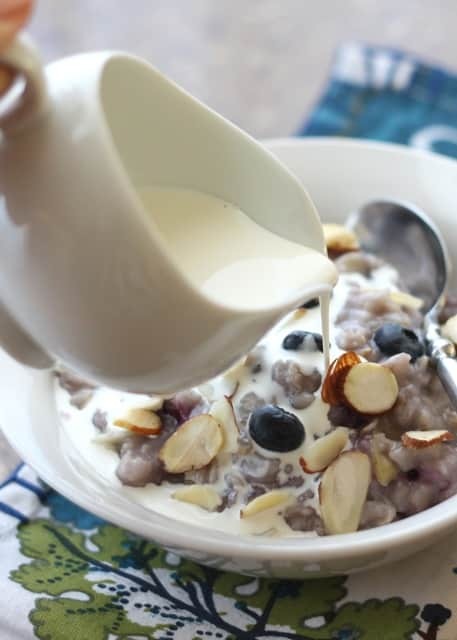 Combine the oats, blueberries, salt, almonds and water in a large saucepan. Bring to a boil and then reduce to a simmer on medium/low until the oats are tender and the oatmeal has thickened, about 5 minutes. Remove from the heat and scoop into serving bowls. Top with the sweetener of your choice and a drizzle of cream or milk. Enjoy! Mary: This the bowl for breakfast made in heaven...I love to add cream on my oatmeal as well -- it makes all the difference-- and eat with fruits! Looking at yours made me want to eat oatmeal again and again. Looks so lovely and healthy. And I completely agree about the cream. Just a little bit is all you need, but it does make it taste so heavenly. Cream (even just a dash) makes all the difference. This looks like such a hearty breakfast. I wish I had a bowl this morning. Thank you for sharing it! This oatmeal looks delicious! My favorite way to eat it is with blue berries!